Evaluate Energy works with the world's leading oil and gas companies and their advisors. We provide simple access to accurate oil & Gas information and analysis on companies, countries, assets, exploration interests and M&A. "The excellent coverage of companies in the energy sectors, and the rapid updating make this an invaluable tool in our analysis of competitive performance. But beyond this, the strategic profiles and the unique forecast module differentiate this service from other data sources - a "must-have" for oil industry competitor analysis." "The information serves our shareholders, as our company can usefully gauge its own performance with independently determined benchmarks set in the market. Upper quartile performance is our ambition - and Evaluate Energy helps to define the goal posts." 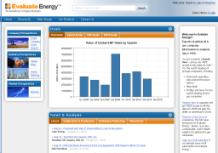 "Evaluate Energy is an excellent resource for my current project and it is pretty easy to use!" "Your website remains invaluable to our annual benchmarking process, and your customer service is first rate." "Evaluate Energy is one of the key analytical tools we use because it is a very reliable way to gain a rapid appreciation of the up-to-date financial and operating profiles of oil companies around the world." "The comprehensive historical data, strategic insights and performance forecasts make this a "must-have" service for oil industry competitor analysis."